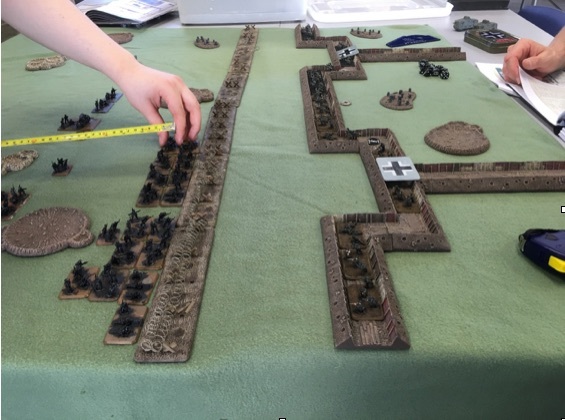 A few weeks back, Patrick and I met up at our local club TCOW to get in our first game of Great War, and although we had a few hiccups rules-wise it was great fun. We decided to play the ‘Over the Top’ mission to get a taste of one of the unique missions available for Great War. The sniper and field gun teams are support. Patrick placed each of his Infanterie Platoons in his trenches, deploying them evenly with one platoon on each objective and his HQ between the two platoons. Thankfully, he had to hold both of his A7V tanks in reserve, which I knew would be a big threat to my infantrymen. 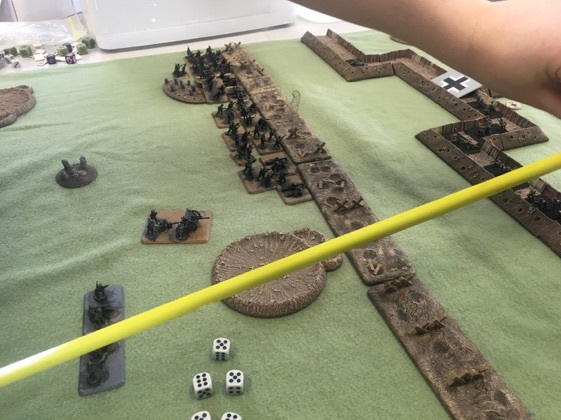 Patrick then placed the six lengths of barbed wire available to him across the entire table in no-man’s land in an attempt to delay my troops for as long as possible. 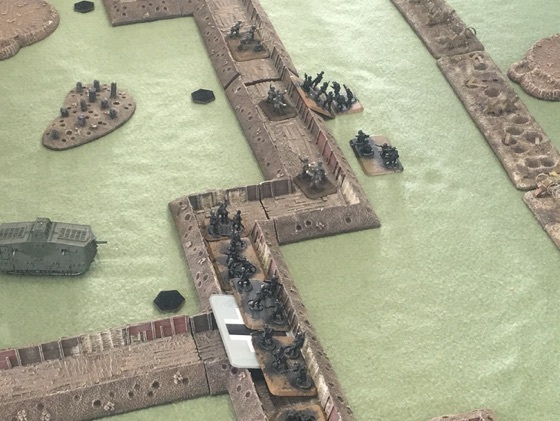 The Germans rush from their dugouts, waiting for the ANZAC attack. 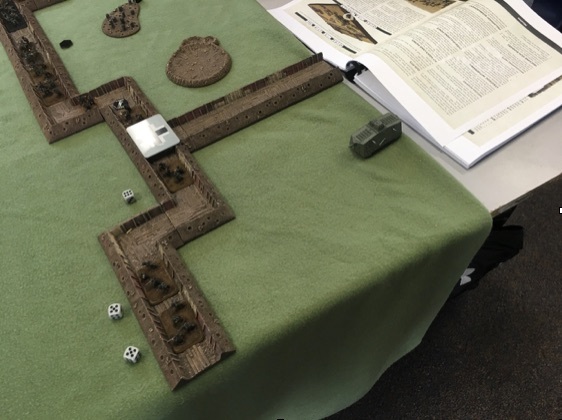 In response, I decided to mass my forces on one flank in order to concentrate the maximum amount of force against a single part of the trench line, so I deployed both of my Rifle Platoons on the right flank along with my HQ and stokes mortar. 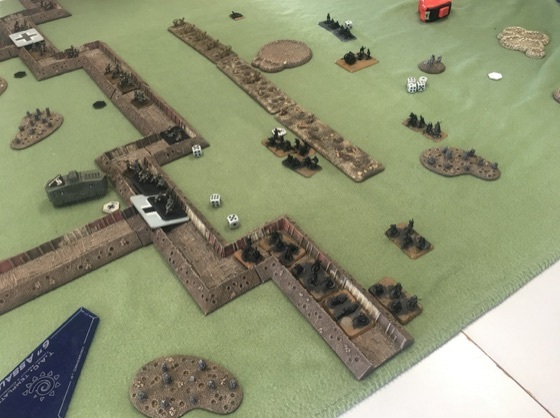 In order to support my assault, I deployed my HMGs, Sniper and 18pdr gun in the centre of the table in order to lay down fire to pin down and hopefully destroy enemy platoons. ANZAC forces prepare to finish crossing no-man's land and get to grips with the Hun. As the attacker, I had the first turn so I moved my troops forward under the cover of darkness to reach the barbed wire preparing to cross it in the next turn. In the remainder of my turn, my supporting weapons either failed to see or hit any German units due to the darkness. In response, the Germans held their fire, biding their time until presented with a more tempting (or vulnerable) target. Part of each ANZAC platoon attempts to gap the wire with one platoon succeeding twice allowing me to remove two of the obstacles. Next, the rest of the platoons surge forwards toward the German positions through the breach. Despite a large amount of firepower being directed at the German defence, the platoon on the right in only pinned with no casualties inflicted. While the fire of the ANZACs was ineffective, the German reply was anything but. The fire of both Infanterie platoons being directed toward the advancing ANZACs kills several teams an pins down both rifle platoons. Dawn breaks removing the protection of darkness for both sides. The ANZAC troops, having been hammered by German fire, fail to unpin and remain where they are but still manage to destroy two German MG08/15 teams. 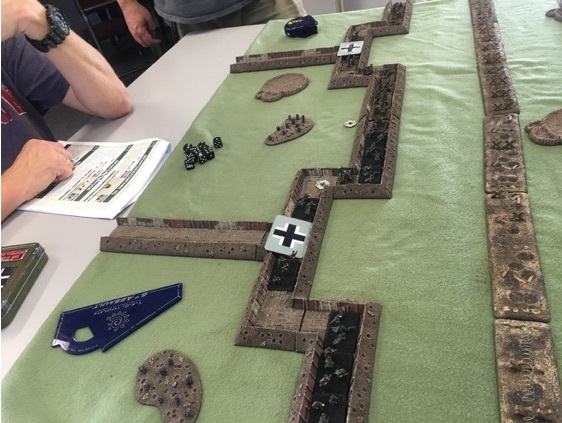 In Pat's turn, the first of his reserves arrive, a lumbering A7V which begins moving toward the advancing allied forces, it's machine guns chattering, though the German shooting this turn fails to cause significant damage. This turn, the ANZAC troops unpin and charge the German trenches, trying to establish a foothold...this doesn't go as planned though. The German defensive fire is brutal with enough hits scored to drive back the charge and re-pin the ANZACs. The Germans then continue the onslaught in their own turn, continuing to fire at the now exposed ANZACs and leaving them all but annihilated. 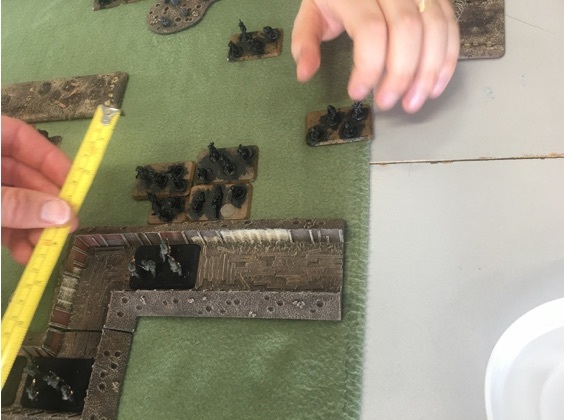 ANZAC reinforcements arrive through the Overwhelming Force rule which allows destroyed units or those in Bad Spirits to be removed and replaced at full strength representing the rest of the attacking battalion moving up in support. 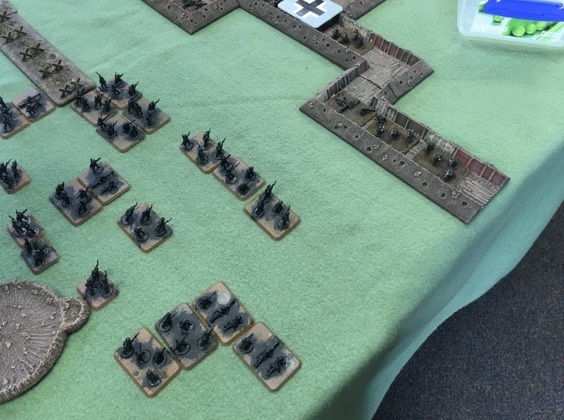 I place the newly arrived infantry platoon on the left flank hoping to exploit the fact that Pat had moved some of his troops to the right flank to provide extra firepower in the last turn. I also remove the last two surviving teams of the second platoon and opt to bring them back on the left flank as well. I'm aware that if my troops aren't in the German deployment zone by the end of Turn 6, I lose. 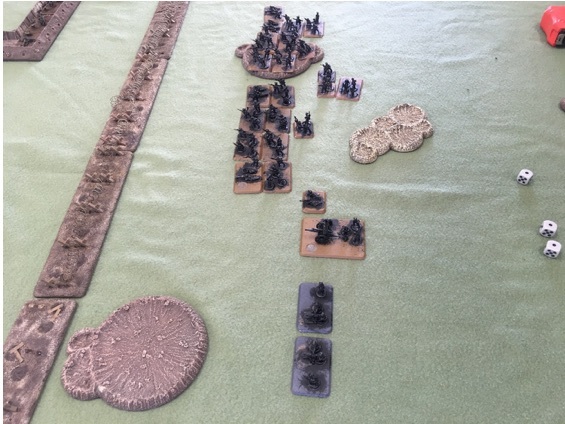 In Pat's turn, he shifts his infantry toward the left flank to close the gap I was trying to exploit. To my horror, he also gets another unit in reserve... his remaining A7V which also arrives on the left flank to threaten my advancing troops. That's it; do or die time. I need to be in the trenches this turn or I lose. I opt to try and charge forward, crossing the barbed wire rather than gapping it and losing a turn of movement as a result. 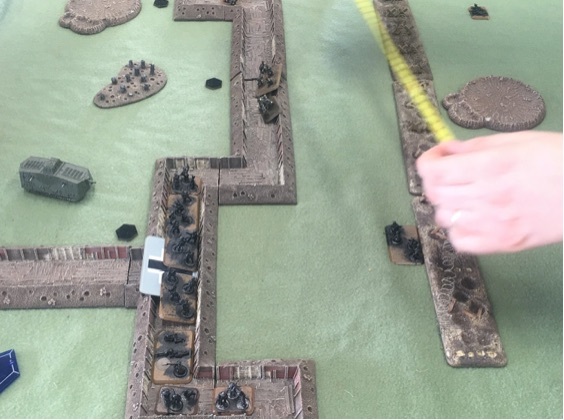 ANZAC shooting kills an LMG team and then one of the ANZAC platoons charges head first into German trench, getting past the defensive fire and destroying a German team before consolidating further into the trench. Pat shift more of his surviving infantry toward the left flank in his turn but his shooting fails to achieve much due to the protection offered by the cratered ground and captured trench, though he does succeed in pinning the ANZAC platoon in the open ground. The ANZAC platoon in the trenches moves forwards and once again succeed in assaulting the German infantry despite the additional defensive fire from the A7V. The German infantry on the objective are destroyed leaving only the panzer holding on. The A7V was damaged by a lucky shot from the 18pdr but the Germans manage to repair it. 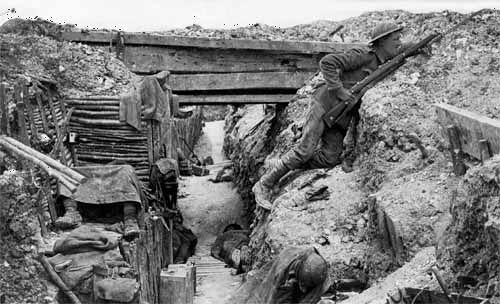 More German troops stream down the trench lines toward the ANZAC foothold but their fire is again stymied by the protection of their own trenches. At this point in the game both sides are very close to breaking. 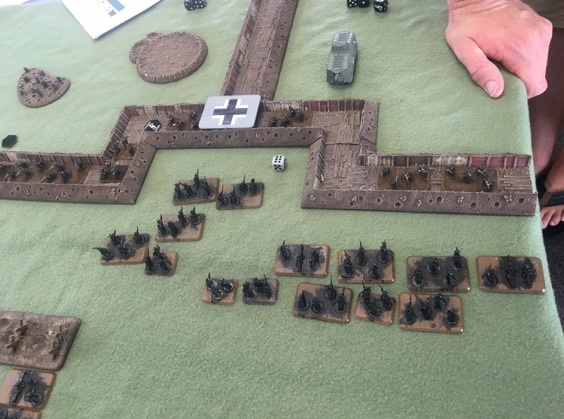 The German HQ is down to one team and one of their infantry platoons is in Bad Spirits. The ANZACs are in a similarly dire situation with their own HQ down to a single team and their only core forces being the trench mortar and the HMG platoon. 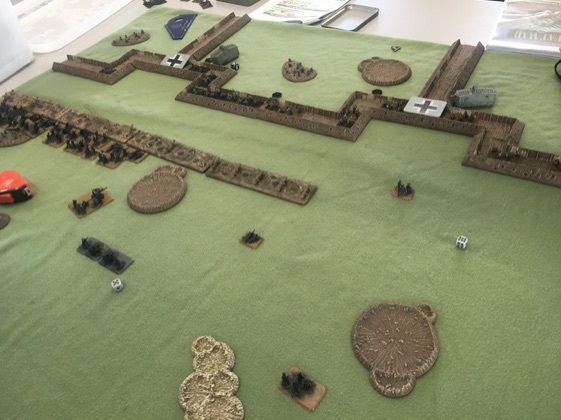 In a cunning attempt to try and break the Germans, the ANZACs charge the middle of the German trenches trying to wipe out both the German commander and the remnants of the badly damaged German platoon. 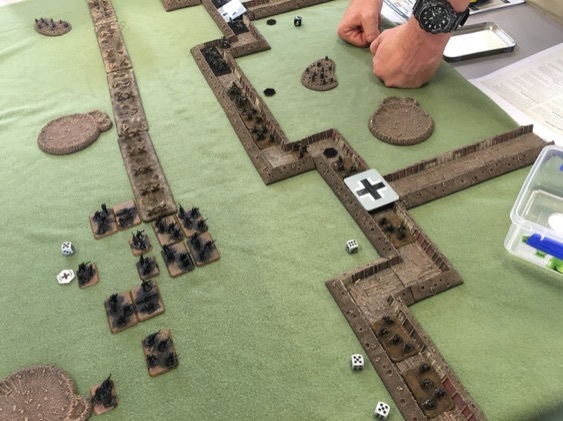 This gambit is only a partial success though with the German infantry being wiped out but at the cost of the ANZAC platoon, leaving the German CiC to fight another day. 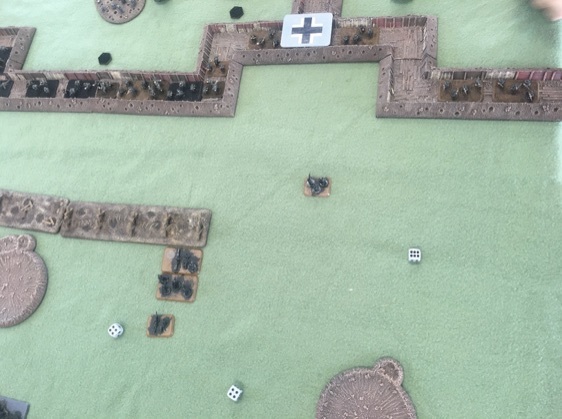 The Germans return fire in an attempt to obliterate the ANZAC commander on the right flank. He manages to keep his head down and survive the fusillade thanks to the protection of the craters. The game remains on a knife-edge with both sides very close to needing a Formation Last Stand check. I decide to try and keep the pressure on both flanks by using the Overwhelming Force rule to bring back the destroyed ANZAC platoon on to the weakened right flank and hopefully rescue the beleaguered company commander. 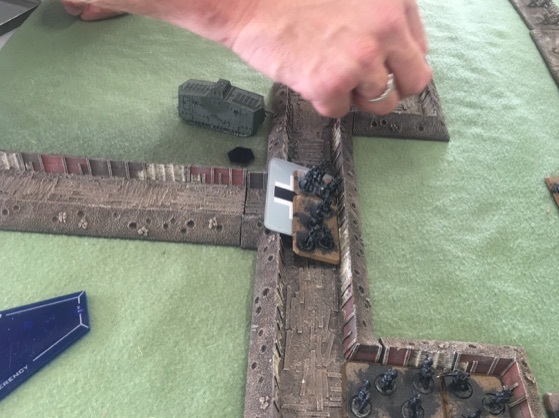 In shooting, I turn my support weapons against the German commander hoping that a lucky kill could take the game... the Vickers HMGs strike home and deliver the killing blow. 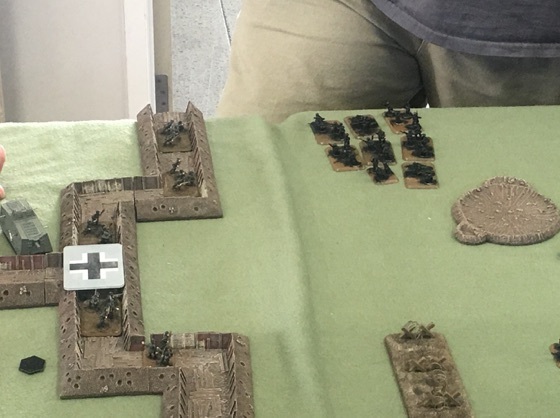 With no HQ and only one infantry platoon remaining, the Germans are broken and retreat. The ANZACs are victorious, but at great cost. As Pat's A7V's demonstrated, tanks in Great war are brutal. The Landships rule means they need two consecutive firepower rolls to be destroyed making them an incredibly resilient delivery mechanism for the firepower they carry. I found that the sniper didn't perform well owing to his short range and single shot. I'd likely put his points toward another mortar or HMG in future games. The Vickers HMG was a great addition, their high RoF enabling me to pin down German platoons even with the protection of the trenches. They managed a number of kills including the vital killing shot on the German commander. In writing the AAR, I've realised that had I spread out my forces both down and along the 'T' junction in the German trenches, I could have forced Pat into a position where he would have to move his A7V within 4" of my troops to contest the objective. This position would have enabled me to use the Sneaking Up on Tanks rule to assault the A7v without taking defensive fire from it. This could have given me the opportunity to win the game earlier had I been able to destroy it. All in all, Great War is a pretty good rule set. Having a knowledge of Flames of War already meant I was well prepared but there were different strategic thinkings I needed to use here. 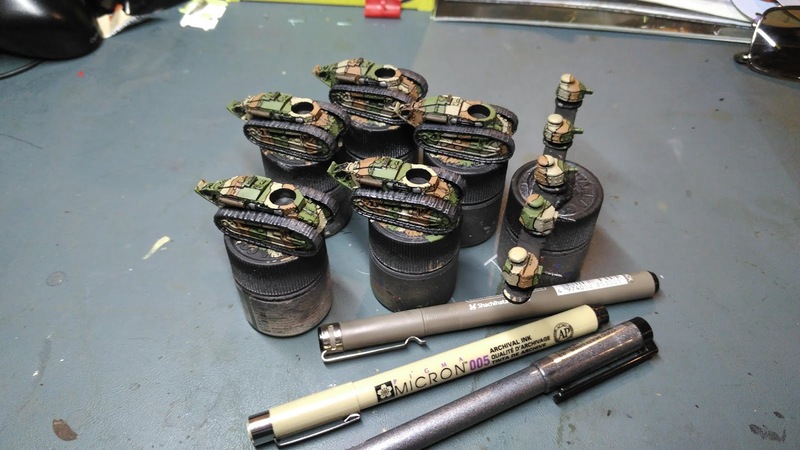 I've been working on my doughboys over the last few weeks and so far I've got a platoon mostly finished, save for the basing (more on that below), and a platoon of FT-17 tanks. On the workbench, I have another infantry platoon and all of the attachments, such as flame-throwers, infantry guns, etc. Once those are done, I should be well placed to have a game with Patrick soon! So I got stuck in grabbing some twigs from the backyard and gluing them to my bases. 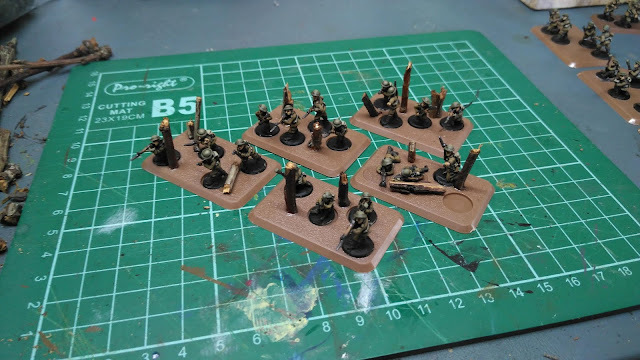 Pro-tip: try and make sure there are some sturdy twigs with a strong superglue bond so that you can pick up your bases using these and not the figures themselves. The bayonets are pretty fragile and I've had several snap off by handling them. So the trees will serve as a hand handle. 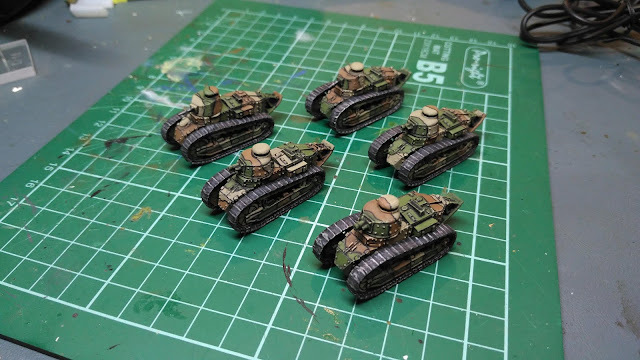 Then there's the tanks. The US primarily used the FT-17 tank. Although American-made versions, called the M1917 Light Tank, were inbound from the states, the US had to make due with French-built ones in the meantime. Had the war gone on into 1919, the US tanks would have arrived and replaced the old clapped out French versions. For painting, I chose the below pictured colors and used technical pens to bring out the panel lines and to also provide black-lining between the camo colors. Anyway, that's all I've got to report for now! Tune in next time, hopefully for a little gun action. When volunteers were called to cover the Great War on Behind Enemy Lines, I wanted to do the Americans. I’ve got several family connections with World War I. Two of my great-grandfathers fought in the war, one in the 123rd Field Artillery (155mm guns, often seen supporting the Big Red One Division) and the other in the ambulance corps. I also had a great-great uncle who died as a Marine in the bloody Battle of Belleau Wood. So when I saw the new Great War book from Battlefront, I was very pleased to see the expanded US forces included. The book includes the the USMC, fresh off the heels of the fighting at Belleau Wood. They are fearless, well trained, and experienced. You also have the Big Red One, 1st Division, which also had battlefield experience by late 1918. You can also combine a USMC formation with a 1st Infantry formation to field the 2nd Division, which was unusual in the fact that it had both an US Army half and a US Marine half. There is also the freshly arrived and eager 42nd Division, which was commanded by General Douglas MacArthur. Together these formations present an excellent cross-section of the US forces in France. I managed to score a copy of the new Brett's Brawlers army box, giving me an excellent start on a US Army. It's got 2 infantry platoons loaded up with flame-throwers, infantry guns, light machine-guns, VB grenade launchers and riflemen. 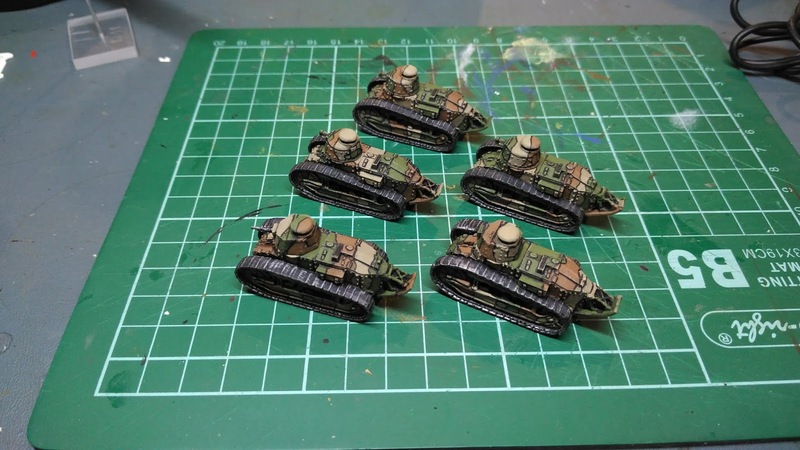 On top of these virtual mini-armies, you also get a platoon of heavy machine-guns, a sniper, a pair of 76mm trench mortars, a 75mm field gun, two FT-17 light tanks and one Char Saint Chamond tank. This is an excellent start! I've got some spare FT-17's that I'll add into the mix to bring the light tanks up to full strength. 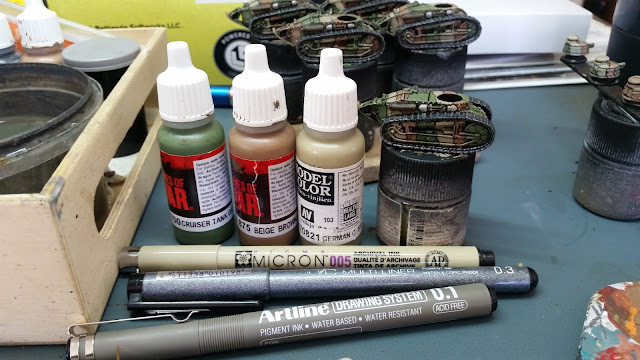 Other than that, that's my painting schedule sorted! Now to get to work!!! The fall came early to the Whytaks, the decimation was swift and unrelenting. While most never made it to the next day, some knew what was coming and made plans to ensure their survival...and least for a short time. Some say that because of the presence of the 'Mercan forces in Akland, we were targeted first. Some say it was random, that nothing would have changed it. The inevitability of the fall making it easier to comprehend. But still others, in muffled grunts from the overgrown forests, will tell you other stories....if they let you live. 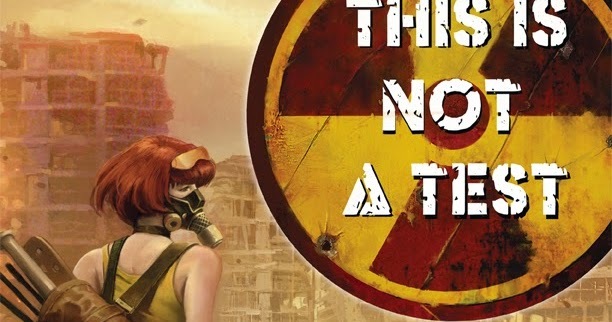 We are about to undertake a campaign of post-apocalyptic warfare and survival here at Behind Enemy Lines using the awesome rule set, This Is Not A Test from Worlds End Publishing. We've had a game of this posted on our YouTube channel before but now you'll get to see a campaign in all its glory! The best part of TNT is the campaign system, seeing your warband progress and thrive...or potentially die as they venture through the their adventures in the wastes. And so, let us take a look at the warbands of the Whytaks. When the bombs fell a company of 'Mercan special forces were in Akland taking part in training exercises. Most of the members in the chaos and devastation that followed perished but a few survived and used their training to set up a peace keeping force for members of the area which was formerly West Auckland. A local council had been formed and the Rangers become one of the official forces of the New Western Dominion. Most squads are led by survivors of the original company or other special forces operatives that have been recruited. Delta squad of the 3rd Company are led by a former NZSAS member known as Ares due to his uncanny instincts in war. Goff's Ghosts are named after a famous mayor of Akland who after being voted out of office in 2019 single handedly took over the Skytower and held it for several days. When the tower was finally secured Goff was nowhere to be found and to this day no one knows how he escaped. As per tradition members of the Rangers only use their call signs and in the new world this becomes their new name. The squad took heavy losses recently and only Ares and a few of his squad made it out. Artemis the scout and sniper never stays in one place long enough to be pinned down and Hunk the engineer had to be physically dragged away from the fight due to his stubborn nature. The new recruits have passed basic training and while not up to what would have been original Ranger standards, these days its this small number of men and women who hold the line against all manner of dangerous mutants, criminals and beasts. Its time for their first patrol in the wasteland that used to be Akland and for some it will be their last. The Enclave. A small bastion of civilization in the wastelands of Akland. Situated on what used to be known Pre-Fall as Te Atatu Peninsula, the Enclave survives due to 3 things. The fact it is surrounded on 3 sides by water, the large wall that cuts the 4th side off from the rest of Akland and the Blue Boys. Immediately after the Fall, the man simply known these days as The Commish gathered as many of Akland's Police Force to the Peninsula as he could find. 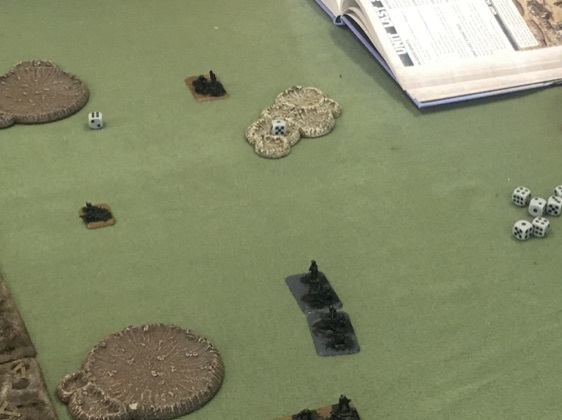 With the help of an AOS Commander, he managed to amass a considerable force, with an armoury to match and set about continuing to uphold their original mandate on a much smaller scale. Protect the public. Over the years, many have tried to break to through the wall that stretches from the creek to the sea, that seals off the Enclave from the ravaged outside, but none have succeeded. This is mainly due to the tactical brilliance and ruthlessness of AOS Commander Wayne Bruce. Fiercely loyal to The Commish, Bruce enforces The Commish's will with an iron fist. Hideously disfigured when he was captured by a band of Raiders who held little love for the authorities before the Fall and even less after, Bruce is never seen without the armoured cowl that hides his face from the world and his trademark long leather coat. The mask, combined with his almost religious zealotry for wiping out Raiders and Muties has turned him into some sort of boogieman to the warbands in the surrounding area and only the bravest or the drunkest stand in his way when he leads one of his heavily armed excursion into the wastes. The mutants simply known as 'The Wasted' have lurked in the Whytak mountains since the great fall, surviving by picking off the survivors stupid enough to venture into their rugged homeland. At first thought a myth to scare travellers, no one returns from the Whytak mountains. But a lone caravaner recently returned, bloody, mangled and completely mad. Jibbering about twisted beings with muscular frames and bone spikes protruding from their flesh. Telling tales of towering behemoth mutants and degenerates that feast on human flesh. Of hounds that have been malformed into nothing but hungry vicious freaks of nature. These rumours are now reality, as the mutants begin to run low on food, they are using their skills as expert hunters and bushmen to venture out of their home and find more victims to cannibalise. I can hear what you're thinking now. The French, are you serious?! Yeah, well I am. In Flames of War - Great War, the French offer some really good tactical options and also allow you, with what is effectively a single army, to field a variety of different forces that fought on the French side in the conflict. Now, while you have a number of options with the French in terms of the infantry, such as Metropolitan, Colonial, Russian or Harlem Hellfighters, because they're essentially using the same gear every time, painting them one way and running them in one of the other flavours shouldn't be too much trouble. While the Colonial and Harlem troops favoured a brown uniform instead of the traditional blue, I'm sure you could sneak it past your opponent! This ends up at 59 points and while it doesn't have tank support to start with, it's still pretty tough. I have a couple of Fusilier sections, one to push forward and flame the trenches before an assault and one to plug gaps if needed. With the Trench Fighters rule, my guys hit on 2+ in assaults which is awesome! They do counter-attack on a 4+ so we just need to make sure we get in tough! Being hit on 4+ should make them pretty survivable as well. Trench Mortars and HMG's are a must in my opinion. They give up multiple chances to pin enemy in trenches or mow down the ones coming toward you in short order. If I'm defending I can also put the HMG's in nests or pillboxes for better survivability. The 75mm gun adds much needed AT if I'm facing tanks, which judging by Pat's lists, I very well could be! So where to from there? Fleshing the list out to 100 points should be relatively easy. As well as French tanks, I get access to the big British tanks as well...but who needs them! 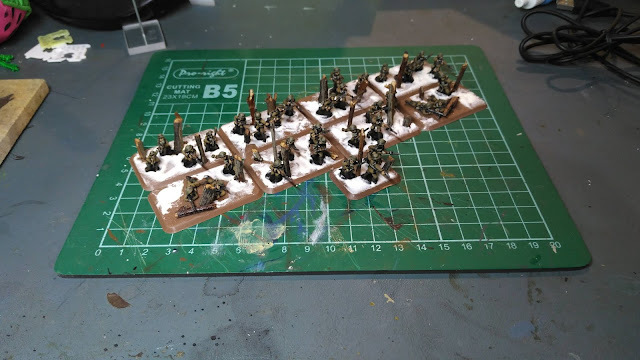 And with that, I'm likely to add either a 2 gun battery of 75mm artillery for both impact and AT capability or, and this may surprise you, another unit of infantry, but this time Colonial Tirailleurs instead of the Metropolitan Fusiliers. My reasoning for this is this... THEY ARE ASSAULT MACHINES!!! I'd arm them with a flamethrower and send them up. They counter attack on a 2+, they hit in assault in a 2+ and they're still hit on a 4+! They're a downright bargain at19 points in my opinion! So there you have the beginnings of my French WW1 force. I'v already started painting so keep an eye here for the first article on that in a week or so!